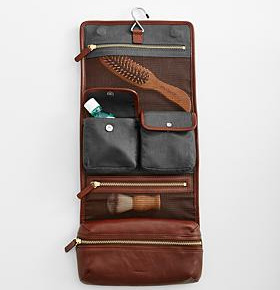 Carry your grooming supplies conveniently and handsomely with this Leather Toiletry Travel Case. This fold-up case has multiple pockets with tumbled nickel/antique brass hardware. It has a handle, convenient hook, mesh pockets, magnetic closure, and even a removable inner pouch. Unfold and use the enclosed hook to hang it for easy use. Choose from either black or brown leather.